Convincing dry, flat, crisp Passover matzo crackers to bend and wrap and remain intact on a panini press isn’t quite the simplest feat I’ve ever attempted. But I went for it anyway. After much trial and error (and more trial and more error), I managed to pull off these Grilled Matzo Brisket Wraps. My friend Tori from The Shiksa in the Kitchen invited me to take part in the Passover Potluck she’s hosting on her blog, and I wanted to come up with a really creative way to use the panini press during Passover. With a husband whose family is Jewish and a babysitter who keeps kosher, I was able to drum up some promising ideas pretty quickly. The challenge, however, came in the execution! In the end, as you can see above, I made it happen. And it happened well! The matzo, once prepared, became almost tortilla-like. 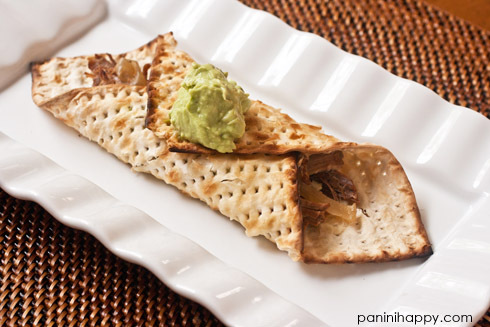 From there I was able to fill it with my slow-cooked brisket and onions and whipped avocado spread, fold it up and grill it like a tasty little matzo burrito (matzo-rito??). So how exactly did I get matzo to bend and grill on the panini press? 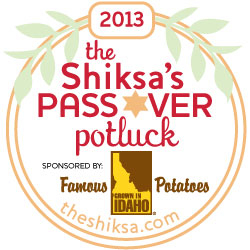 Hop over to The Shiksa in the Kitchen and read all about it in my guest post. I’m so impressed with everything you do with a panini press – this has to be one of the most creative yet! So happy you could join us at the Passover table, Kathy! I absolutely love your Grilled Matzo Brisket Wraps. Fabulous! You are so creative, Kathy! I love this! This is so creative! And looks so delish! I’ve tried matzo before and I thought it tasted like cardboard! But this may make it a lot tastier! Next post: Grilled Cheese Month is Here!